Hailing from the stark, prairie metropolis of Edmonton, Alberta, Kane Incognito is the dynamic brainchild of Eric Kane Cherrington. After the loss of his brother and No Heat Tomorrow bandmate, Keeth Cherrington, Eric turned to music and formed Kane Incognito with his cousins, Austin and Braydon Shaw and childhood friend, Stephen Schoenthaler. The result is a deep blend of folk and rock music that is best described as the love child of Mumford & Sons and The Foo Fighters. Their first single, 'Young & Able' was released in June of 2017 and hit number eight on the iTunes Rock Charts and was nominated for 'Rock Recording of the Year' at the Edmonton Music Awards. The band released their debut album Brother in October of 2017. 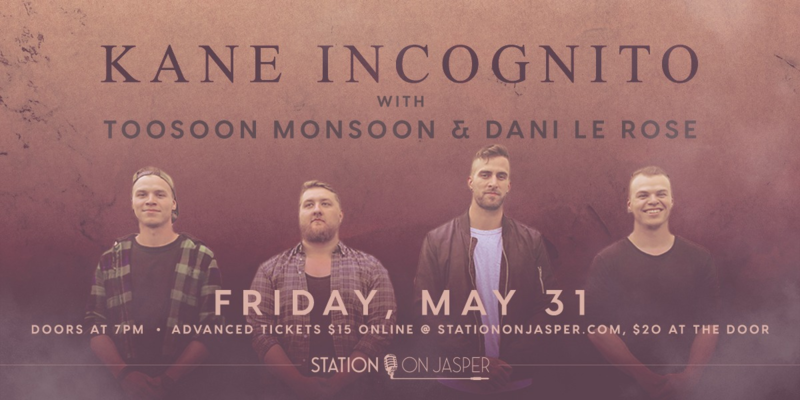 They released their next single, 'Diagnose Me' in June of 2018 and it was met with stellar reviews from Pure Grain Audio, Canadian Beats Media and Turn Up The Volume! The band has played several music festivals including Seven Music Festival and Wild Mountain Music Festival, and has opened for a string of popular artists including Hey Ocean!, Elle King, Banners, Carmanah, Twin Bandit , The Blue Stones, and Grandson. Catch them live on Friday, May 31. Doors at 7 PM.